The goal of my recipes will be to provide you with the why and how to prepare different dishes. These are the same explanations provided to my students at SCARTS. Classic cuisine served the modern way! Food and design is a big trend and popular. This will be shown with ScandinaVian Marinated Salmon, Asparagus, Balsamic Sauce. The presentation of the plate below is called “disorganized order.” The decoration looks messy but it takes lots of attention and details to balance colors and flavors. It gives guests the possibility to taste everything separately. The presentation of the plate is important, but more than that, is the food pairing. Marinated salmon taste sweet and salty, with a dash of spices. Asparagus is biter, the sauce will give a sweet acidity (Balsamic vinegar) and strong flavor (mustard). To finish, sweet carrots, light strong tarragon and sweet rose petals. The balance will be achieved with a combination of sweet, salty, bitter, sour and light spicy. Buy the salmon skin out and bones out. Prepare the mixture of spices, salt and sugar – marinade the salmon 2 days, turning the salmon every 12 hours (8 am – 8 pm). The last day, add the finely sliced dill. Cut the salmon in nice cubes. 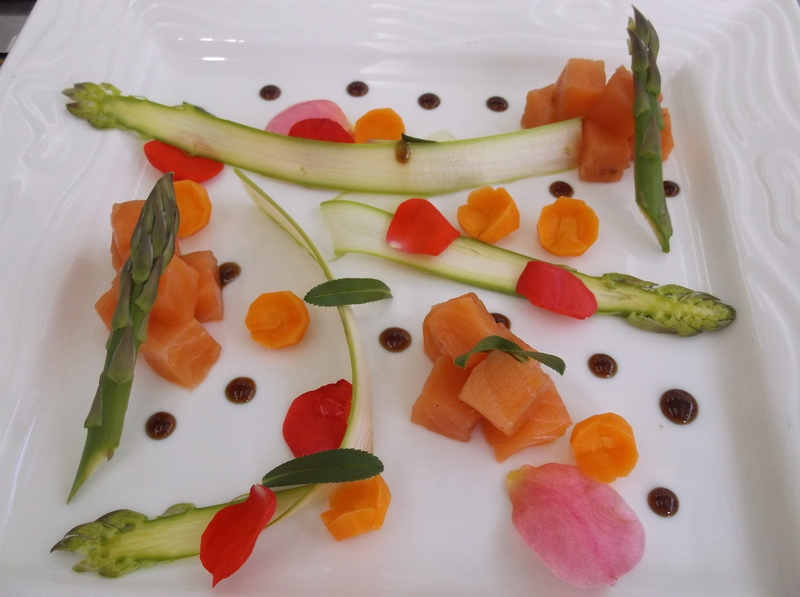 Finish the presentation of the plate according to the picture (the asparagus will be served raw, to emphasize the bitterness and the freshness of the vegetable – the carrot will also be served raw). Dry white wine would be perfect. Chardonnay or Sauvignon from California or Washington wines. Champagne Brut would also match perfectly. To read the Luxe Beat Magazine version of this article click on the title Classic Cuisine Served The Modern Way.